Conveniently located in the quiet Mahlsdorf district of Berlin, this family-run, 3-star hotel sits just off route B1, which goes between the center of the city and the beautiful countryside. The Garni-Hotel An der Weide is just a 10-minute walk away from the Mahlsdorf S-Bahn (light rail) station, providing access to the center of the city in approximately 20 minutes. Route B1 also provides direct access to Berlin and highway A10. Guests at the Garni-Hotel An der Weide will enjoy modern and comfortable rooms, a delicious breakfast buffet, free Wi-Fi internet access and the friendly staff. Drivers will benefit from free parking in the hotel parking lot. Popular attractions in Berlin include the Brandenburg Gate, Friedrichstraße, the Museum Island and the Alexanderplatz square. 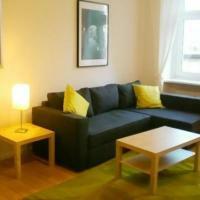 Real Apartments offer spacious, fully furnished apartments in various locations in central Berlin. They provide everything you need for a comfortable self-catering break in the city. The apartments are all within walking distance of the popular Hackescher Markt shopping area and the Alexanderplatz square. Excellent public transportation connections help you explore the whole city with ease. Further details can be found under the separate apartment listings once you have input your dates. 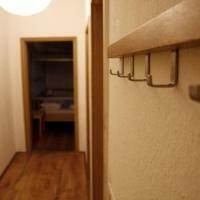 This hostel is located in one of the most popular and trendy districts of Berlin, in the Prenzlauer Berg district. Lette’m Sleep offers a friendly and relaxed place to stay near the center of Berlin – just 3 subway stations from Alexanderplatz. There are also excellent city train, bus and tram connections from the hostel, meaning that you can easily visit all main sights and attractions in the German capital. Indeed the vibrant cafe culture and numerous nearby pubs, restaurants and clubs mean that you may not wish to move too far away from the hostel. Other features offered by the Lette’m Sleep Hostel are free internet access and a summer beer garden. There is no curfew here, meaning that all day and all night you are free to enjoy all that this exciting area of Berlin has to offer. This 4-star hotel in Berlin's gay area offers designer rooms, a rooftop bar with panoramic views, and a modern spa. The KaDeWe department store is a 5-minute walk away. The rooms and suites of the Axel Hotel Berlin include large beds, flat-screen TVs and iPod speakers. Wi-Fi is free in the entire hotel. The Axel's spa area has a hot tub, several saunas, a Turkish bath, and a gym. The Axel Berlin's Urban Bar is popular with gay guests and the general public. The Wittenbergplatz subway station is a 5-minute walk from the hotel. Various gay clubs and bars are just steps away. Just 325 ft from Berlin’s historic Gendarmenmarkt Square, this 4-star designer hotel features soundproof rooms with a flat-screen TV, a stylish breakfast restaurant with great views, and a courtyard terrace. Winters Hotel Berlin Mitte Am Gendarmenmarkt has air-conditioned rooms with bright, minimalist décor, a desk, and a minibar. Free Wi-Fi is available in public areas, and the rooms have free wired internet access. Varied buffet breakfasts are provided at the Winters Hotel. In summer, guests can eat outside on the quiet terrace. Fine drinks are served in the lobby bar. Stadtmitte subway station is only 650 ft from the Winters Hotel Berlin Mitte. Direct trains run to Potsdamer Platz Square and Alexanderplatz Square in 7 minutes. Underground parking is available at the Winters Hotel upon request. 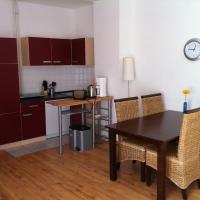 These fully furnished vacation apartments are close to Berlin's popular Prenzlauer Berg district. They offer a well-equipped kitchen and good public transportation access. Ferienwohnungen Stettiner offer modern interiors with laminate floors. The kitchen includes a dining area. All apartments feature cable TV, a sitting area and a balcony. The Stettiner apartments are a 5-minute walk from Pankstraße Underground (subway) Station and a 10-minute walk from Bornholmer Straße Train Station. Guests will find many cafés and shops on their doorstep. The Gesundbrunnen shopping center is a 5-minute walk away. Just a 15-minute walk from Berlin’s famous Potsdamer Platz square, this modern self-catering apartment enjoys quick access to public transportation going to all major sights and the ICC convention center. The 2-room Klene Apartment is just a few steps from the Kurfürstenstraße and Bülowstraße subway stations. They offer direct access to attractions including the Alexanderplatz square, Kaiser Wilhelm Memorial Church and historic Friedrichstraße. Look forward to the apartment’s bright interior design, fully equipped kitchen and spacious bathroom. Up to 5 people can be comfortably accommodated here. The grocery stores, eateries and shops at your doorstep promise a truly relaxing stay. 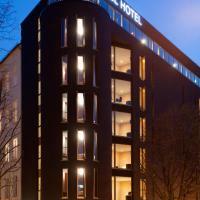 This hotel is in the heart of Berlin, between the popular districts of Mitte and Prenzlauer Berg. 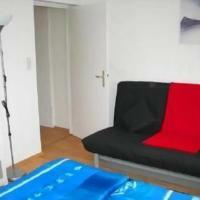 It is right across from Rosenthaler Platz subway station, 2 stops from Alexanderplatz. Rooms at Circus Hotel Berlin feature modern décor with free Wi-Fi and a flat-screen TV. All have a private bathroom with shower, and some have an extra living area. Fill your plate from the all-you-can-eat breakfast buffet in the mornings. Enjoy snacks and drinks from the Circus Café, or German specialties at Fabisch restaurant. The Circus Hotel is a 5 minute walk from the trendy shops, cafes and galleries of the Hackescher Markt area. Goldman's Bar at the hotel features its own Hoff shrine - a homage to the actor/singer David Hasselhof. The 24-hour front desk at the Circus Hotel offers rental bikes. It is also a great base to explore Berlin via tram, bus, train or subway. This designer hotel with free Wi-Fi is a 5 minute walk from the Hackescher Markt entertainment district in the center of Berlin. It offers a courtyard garden, rooftop terrace and underground parking. The air-conditioned rooms and apartments at the 3-star Hotel AMANO feature hardwood floors and a flat-screen TV with satellite channels. Guests can rent an Xbox with games, iPods and DVDs. The AMANO is 220 yards from Rosenthaler Platz Underground (subway) station, and many of Berlin’s coolest fashion boutiques and art galleries. Bicycles and tandem bikes can also be rented for exploring the heart of Berlin. In the afternoon guests can relax in the lobby bar or on the rooftop terrace. In the evenings, there is a range of creative drinks offered in the award winning AMANO Bar. These modern apartments in Berlin are located right on Alexanderplatz Square. 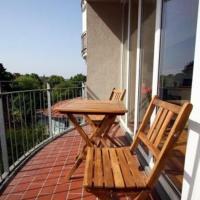 They each offer free Wi-Fi, a fully equipped kitchen, and a view of the famous TV tower. The self-catering Alexanderplatz Apartments are brightly decorated and include free bed linens and towels. Each has a sitting area and TV. 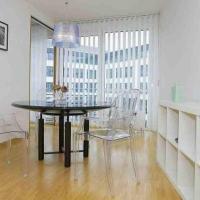 Alexanderplatz Apartments are a 5-minute walk from the Hackescher Markt nightlife and shopping area. The famous Unter den Linden Boulevard is a 10-minute walk away. The bus, tram, subway and S-Bahn (light rail) services at Alexanderplatz provide access to all parts of Berlin. Berlin Central Station can be reached in 10 minutes via public transportation and both Tegel and Schönefeld Airports are 40 minutes away. This 4-star Superior hotel features a top-floor sauna and fitness area, and air-conditioned rooms with flat-screen TVs. It stands in Berlin's Mitte district, a 15-minute walk from Alexanderplatz. The rooms at the Leonardo Royal Hotel Berlin feature large windows and bright décor. Hot drinks facilities and minibars and Wi-Fi is provided, which is free of charge in some rooms. A buffet breakfast and Mediterranean cuisine is served in the Vitruv restaurant. Guests can relax in the Leo90 bar or outside on the Leonardo Royal’s terrace. Tram and bus services stop right outside the Leonardo. The pretty Volkspark Friedrichshain Park is a few steps away. This 3-star-superior hotel is in Berlin’s Charlottenburg district, between Berlin’s Exhibition Center and the Kurfürstendamm shopping street. All the rooms at Leonardo Hotel are air-conditioned and have a flat-screen TV. Leonardo Hotel Berlin offers spacious rooms with hot drinks facilities, a work desk and a private bathroom. Wi-Fi is available in the whole hotel. An optional rich buffet is served every morning in the Leonardo’s colorful breakfast room for an additional charge. Guests can also enjoy drinks and snacks in Wilma’s bar/lounge with its chic modern interiors. The Deutsche Oper (opera house) and the Wilmersdorfer Straße shopping area are a 5 minute walk from the Leonardo. Leonardo Hotel Berlin is 100 yards from Bismarckstraße Underground Station, which provides a direct connection to Potsdamer Platz and Alexanderplatz. It is also a 3 minute walk from buses to Tegel Airport. This 4-star hotel offers an indoor pool, gym and air conditioned apartments with a modern design. It is beside Berlin’s Natural History Museum, a 10-minute walk from Berlin Central Train Station. Adina Apartment Hotel Berlin Hauptbahnhof provides non-smoking apartments with flat-screen TV and soundproofed windows. Local specialties and Australian cuisine are served in Restaurant Alto, as well as light snacks, breakfast buffets and a large selection of wines. Adina’s courtyard terrace is open in warm weather. The hotel is a 10-minute walk from the stores and theaters of Friedrichstraße. Naturkundemuseum Metro Station is a 4-minute walk away, providing easy access to Checkpoint Charlie. A private parking lot is available of the Adina Apartment Hotel Berlin Hauptbahnhof. This 3-star boutique hotel is in a historic building in the trendy Prenzlauer Berg district of Berlin. It features classical-style rooms, original works of art, and great transport connections. The rooms and suites of the Myer's Hotel Berlin feature high ceilings, fine wood, and paintings. Pictures by local artists are displayed in Myer's Hotel Berlin's courtyard. A big breakfast buffet is available in the hotel's Yellow Salon. Guests can also relax in the smokers’ lounge, Havana-style lobby bar, and conservatory. The Senefelder Platz subway Station is only a 3-minute walk from Myer's Hotel. The famous Alexanderplatz square is just 1 stop away. Direct trains run to the Kurfürstendamm shopping street within 20 minutes. These spacious apartments in the trendy Prenzlauer Berg district of Berlin have easy access to public transportation, and are just one mile from Alexanderplatz square. 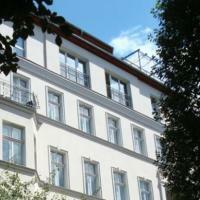 The tastefully furnished Apartments city-room Berlin can be found on the second floor of a quiet courtyard. They feature a range of modern appliances and comforts, such as free Wi-Fi internet access. These apartments are an ideal base to explore Berlin. The Schönhauser Allee S-Bahn (light rail) and U-Bahn (subway) stations are less than 1300 ft away providing easy access to all areas of the city. You can reach attractions such as the Brandenburg Gate, the Friedrichstraße shopping street and the Potsdamer Platz entertainment district in less than 20 minutes using public transportation. Many diverse restaurants and lively bars to suit all budgets can be found within walking distance. Breakfast is available in the restaurant across from the hotel. This 3-star hotel offers free Wi-Fi internet and in-room flat-screen TVs. It is in the Berlin’s Friedrichshain district, less than half a mile from the Warschauer Straße light rail train and subway station. 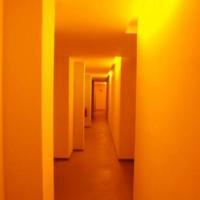 The rooms at the NU Hotel Berlin are bright and have a private bathroom. Guests will find free internet terminals in the lobby. A breakfast buffet is served each morning in the NU Hotel’s breakfast room. The NU Hotel Berlin is close to many restaurants, pubs and clubs. The O² World sporting arena and concert venue is less than a 15 minute walk from the NU Hotel. Boasting concierge service and top-quality security, this exclusive suite in central Berlin enjoys direct access to the historic Friedrichstrasse, Gendarmenmarkt square, and Checkpoint Charlie. The VIP Suite provides a bright, tastefully furnished home within walking distance of the famous Unter den Linden boulevard and Brandenburg Gate. Offering free wireless internet access and a generously equipped kitchen, the 57 m² suite is also suitable for longer stays. Highlights include a flat-screen TV and CCTV surveillance system. The nearby underground connections will quickly carry you to all destinations across the city. In Berlin-Mitte, the Hotel Gendarm nouveau offers designer rooms and suites with free Wi-Fi. The Friedrichstraße shopping street and the Stadtmitte Subway Station are just 650 ft away. All rooms and suites at the Hotel Gendarm include modern art, a stylish bathroom and a flat-screen TV with satellite channels. All have a sitting area and minibar. Breakfast is available each morning in the Gendarm’s Sunflower Lounge. An exclusive breakfast is served on the 7th floor for an extra fee. Exotic cocktails and German beers are served at the lobby bar. Interesting attractions within a 10-minute walk of the Hotel Gendarm nouveau include Checkpoint Charlie and the Deutscher Dom Cathedral. In the ÏMA Design Village in the trendy Kreuzberg district, these loft apartments offer free Wi-Fi and kitchenettes. The popular Oranienstraße with its restaurants and bars is a 5 minute walk away. The spacious apartments come with a CD player and light furniture. They are in an impressive old factory building, which features an industrial elevator. The ÏMA Design Village includes a bistro that offers a breakfast menu and lunch specials. A theater school, different art studios and several design companies are also on site. Guests can rent bicycles to explore the surroundings of ÏMA Loft Apartments. Moritzplatz subway station is a 3 minute walk away, and trains run to Alexanderplatz in approximately 4 minutes. This 3-star hotel in Berlin's city center offers free Wi-Fi, free private parking, and easy transportation connections. The Sony Center and the Potsdamer Platz square are just 1.5 miles away. The Potsdamer Inn provides modern rooms with satellite TV, sitting areas, and private bathrooms. A rich breakfast buffet is available at the Potsdamer Inn every day. The Inn’s traditional-style restaurant serves popular German and international meals. Guests can also relax in the hotel bar. The Bülowstraße subway station is only 170 yards from the Potsdamer Inn. It provides fast connections to the famous Alexanderplatz square and the ICC Messe exhibition center. The 3-star Hotel Aquino offers quiet rooms with a work area and free internet. It is a 3-minute walk from the Friedrichstrasse shopping street and enjoys excellent transportation connections. The Hotel Aquino Tagungszentrum is located in Berlin's central Mitte district. Many restaurants and bars can be reached on foot. Oranienburger Tor subway and tram stops are a 4-minute walk away, and Berlin's central train station is a 15-minute walk away. The Aquino offers a large breakfast each morning. At other meal times, the restaurant offers a wide range of cuisine. A wine lounge is also available. All rooms include a small work area with free internet via cable. The Hotel Aquino also offers various conference rooms, and a church is available on site. This hotel and restaurant is conveniently located just to the east of Berlin city centre, 3 minutes' walk from Friedrichsfelde Ost S-Bahn Station. Guests have free Wi-Fi access in the entire hotel. 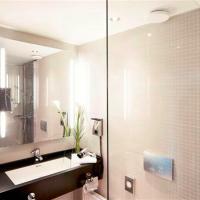 Newly opened in June 2013, all rooms at Aga's Hotel feature a TV and a private bathroom with shower and hairdryer. A hearty buffet breakfast is served every day. The hotel's restaurant serves modern and traditional cuisine. Guests can relax in the hotel's spa area, which includes a sauna, massage facilities and cosmetic treatments. Alexanderplatz Square is 7 km away or 15 minutes by public transport. Just 220 yards from the famous Kurfürstendamm shopping street and the Adenauerplatz subway station, these elegant rooms and apartments feature free Wi-Fi and a balcony. 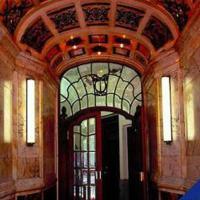 The Hotel Maison Am Adenauerplatz provides Art Nouveau-style accommodations with a private bathroom and a TV. The nearby S-Bahn light rail station provides a direct connection to the ICC Congress Centre. Guests traveling by car will find free public parking spaces close to the Hotel Maison Am Adenauerplatz. Boasting excellent transportation connections, these modern, self-catering apartments in Berlin’s lively district of Mitte enjoy direct access to sights including the famous Alexanderplatz square and trendy Hackescher Markt area. The brightly decorated Central Apartments Berlin offer cozy beds, well-equipped kitchens, and attractive bathrooms. Free wireless internet access is available. The apartments’ proximity to U-Bahn (underground), tram, bus, and S-Bahn (city train) services is ideal for sightseeing trips. Attractions including the Brandenburg Gate, Potsdamer Platz square, and Checkpoint Charlie are all within comfortable reach. Look forward to exploring the countless restaurants, colorful shops, and exciting nightlife venues at your doorstep. These cozy apartments are located in the heart of the Schöneberg district of Berlin, close to Nollendorfplatz subway station and countless bars, clubs and cafes. Tom’s Apartments are fully-equipped and feature a modern kitchen, free Wi-Fi internet access and a bathroom with a bathtub. Some also boast their own balcony. Many attractions are within walking distance of Tom’s Apartments, such as the world-famous KaDeWe department store and the Kurfürstendamm shopping street. Other popular sights, such as the Brandenburg Gate and the Potsdamer Platz, as well as Tegel and Schönefeld airports, are within easy reach via public transportation. This modern 3-star apartment is a 10-minute walk from the famous Kurfürstendamm shopping boulevard and boasts excellent transportation connections to the ICC convention center and attractions including the Alexanderplatz square. The Apartment Abendstern is situated in the immediate vicinity of the Charlottenburg S-Bahn (city train) and Wilmersdorfer Strasse U-Bahn (underground) stations. They ensure fast connections to key destinations across the city. Look forward to the Abendstern’s bright furniture, relaxing atmosphere, modern amenities. In the morning, you can help yourself to a tasty breakfast. These modern apartments are located in Berlin’s stylish Charlottenburg district, 650 ft from the Kurfürstendamm shopping mile. Adagio Kurfürstendamm apartments offer free wired Internet and a fully equipped kitchen. Adagio Berlin Kurfürstendamm features air conditioning and contemporary decor. All apartments include a flat-screen TV with satellite channels, a work desk and a bathroom with bathtub and shower. The front desk at the Adagio Berlin is open 24 hours. Guests enjoy free Wi-Fi in the lobby. Uhlandstrasse Subway Station is less than half a mile from the Adagio Kurfürstendamm. Regular buses run to western Berlin’s main attractions, including Berlin Zoo, the Memorial Church and the world-famous KaDeWe departure store. The Adagio Berlin Ku’damm offers on-site parking and is a 4-minute drive from Berlin’s A100 city highway. The ICC Exhibition Center and Tegel Airport are within a 10-minute drive away. Free Wi-Fi and great public transportation connections are featured at this 3-star hotel in central Berlin. The Potsdamer Hof is a 10 minute walk from the Potsdamer Platz entertainment district and Philharmonic Hall. Hotel Potsdamer Hof Berlin am Potsdamer Platz provides non-smoking rooms with classic décor and warm colors. A flat-screen TV, desk and private bathroom are standard in all rooms. A full breakfast buffet is served each morning in the cozily furnished breakfast room. Potsdamer Brücke bus stop is 220 yards away. Mendelsohn-Bartholdy-Park Underground Station on the U2 line is a 10 minute walk away. This 3-star hotel is located on Berlin’s famous Kurfürstendamm boulevard, a short walk from the Memorial Church, Zoo and KaDeWe Department Store. All rooms include antiques and free Wi-Fi. The Askanischer Hof Berlin features stylish interiors in a charming 1920's design. Breakfast is served each morning at the Askanischer Hof. The Askanischer Hof is near Savignyplatz S-Bahn (light rail) Station and Adenauerplatz Underground (subway) Station. It offers good links to all parts of Berlin, including the 2 airports and the ICC Exhibition Center. This stylish hotel provides comfortable accommodations and free Wi-Fi in public areas and some rooms. It is just a few steps from Lake Wannsee and Wannsee S-Bahn Train station. The charming Wannsee Hof hotel has tastefully-furnished rooms with free satellite TV. A full breakfast buffet and a selection of international dishes are served in the hotel restaurant. Cocktails and other drinks can be enjoyed at the cozy bar. You will find many cafes, restaurants and bars in the immediate area of the Wannsee Hof. It takes around 20 minutes to reach Potsdam, Berlin's city center and Berlin's ICC Exhibition Center via S-Bahn train. These spacious, modern apartments in central Berlin are just a 5-minute walk from the Tiergarten park. They offer free Wi-Fi and easy access to public transportation. The bright Parkapartments - Berlin feature stylish furniture, a flat-screen TV, and a CD player. Nearly all have a balcony. The Wittenbergplatz U-Bahn (subway) and KaDeWe department store are a 10-minute walk from the Parkapartments. Private parking spaces are available at the Parkapartments for an extra fee. Located at different addresses in Berlin's Mitte district, these attractive apartments with balcony offer easy access to public transportation and modern facilities for a comfortable self-catering break. The Central Berlin Apartments feature parquet floors, a modern bathroom and a flat-screen TV. They also provide free Wi-Fi access, a comfy bed, a large balcony, and a fully equipped kitchen. Choose between the Weinberg Apartments which are close to the lively Prenzlauer Berg district and overlook the Weinbergspark, and the Mercury Apartments which are a short walk from the central station and overlook the Humboldt University building. Please see the individual apartment descriptions for further details. This bright one-room apartment provides an affordable base in Berlin’s lively district of Prenzlauer Berg, just a 5 minute walk from the Greifswalder Strasse S-Bahn (light rail) station and tram stop. The self-catering Business Apartment features stylish details such as a flat-screen cable TV, internet and fax connections, and a CD player. Its elegant features include a comfortable double bed, a sofa bed, and a small kitchenette. Thanks to your convenient location, you can quickly reach the trendy restaurants, bars, and boutiques surrounding Prenzlauer Berg’s Kollwitzplatz square and Kastanienallee street. The M4 tram stop connects you to the famous Alexanderplatz square in about 15 minutes, as well as the Hackescher Markt district, Berlin Cathedral, and Museum Island. The Greifswalder Strasse S-Bahn (light rail) trains provide direct services to destinations including the ICC convention center. Enjoying excellent access to public transportation and highways, this cozy guesthouse in the Tempelhof district is just 20 minutes from Berlin’s main tourist and cultural attractions. Pension Bolle offers tastefully furnished rooms with private bathrooms with a kitchenette. Get your day off to an energetic start in the breakfast room. Wind down for the evening by relaxing in the sauna or jacuzzi. Pension Bolle is close to the Schöneberg highway junction, offering easy access to the A100 and A103 highways. Guests can park for free directly at the guesthouse. The nearby U6 Metro line takes you directly to the Friedrichstraße station, from where you can easily get to sights such as the Reichstag, Brandenburg Gate, Potsdamer Platz and Alexanderplatz. This 4-star hotel in Berlin features modern rooms, a rooftop terrace and a spa area. 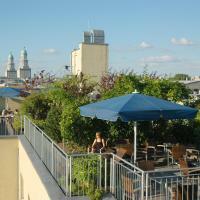 It is in Berlin's lively Friedrichshain district, a 10 minute walk from the O² World arena. All rooms at the Upstalsboom Hotel Friedrichshain include satellite TV and a minibar. The hotel also has apartments with a full kitchen. Wi-Fi internet is available in rooms and is free in public areas. The spa area features a sauna and infrared cabin. After a workout in the gym, guests can take a rest in the relaxation area. The Friesendeel restaurant offers a range of international cuisine. Visitors are welcome to relax with a drink in the Comenius Lounge or on the rooftop terrace. Warschauer Strasse S-Bahn Train Station is a 5 minute walk away, offering connections across Berlin. The East Side Gallery is half a mile from the Upstalsboom. Just a 5-minute walk from the Kurfürstendamm shopping street, the Hotel Savigny has a 24-hour bar and free Wi-Fi. Konstanzer Straße Underground Station is a 2-minute walk away. All rooms at the Savigny include satellite TV and a private bathroom with hairdryer. A large breakfast buffet is provided each morning at the Hotel Savigny. In warm weather, guests can relax on the terrace. Free parking permits are available to guests at the Hotel Savigny. Just an 8 minute walk from Berlin’s KaDeWe shopping mall and the large Kurfürstendamm shopping street, this boutique hotel offers modern rooms and free Wi-Fi internet access. Every room at the non-smoking Mercure Hotel Berlin an der Urania has a flat-screen TV with satellite channels, a minibar and private bathroom. A rich breakfast buffet is served at the Mercure Hotel Berlin an der Urania every morning. Equipped with designer furniture, the bright hotel bar offers international drinks and small snacks. Rental bicycles are available for discovering Berlin by bike. A selection of restaurants, shopping and bars are within walking distance. Wittenbergplatz Underground (subway) station is a 5 minute walk from the hotel, providing a direct link to the ICC Exhibition Center and Alexanderplatz Square. This 4-star-superior hotel in Berlin's Neukölln district is part of a large convention and entertainment center. It offers live shows, a spa, and a direct bus service to Schönefeld Airport. The spacious rooms at the Estrel Hotel Berlin are decorated in soft, natural colors. Each room is air conditioned and features soundproofed windows. The stylish bathroom includes a bathtub and hairdryer. International cuisine is served in the Estrel’s 5 restaurants. These are located in the large, Mediterranean-style atrium. There are also 3 bars, a smoking lounge and a beer garden overlooking the Neukölln canal. Musical and comedy concerts are shown on site. Guests can also relax in the Estrel’s sauna or work out in the gym. Sonnenallee S-Bahn Station is just a 2-minute walk from the Estrel Berlin. Trains run directly to the ICC Exhibition Center. This 3-star hotel is in Berlin's southern district of Steglitz. Hotel Morgenland is a 5 minute walk from the Bundesarchiv Archives and a 10 minute drive from the Botanical Garden and Schlossstrasse shopping mile. All rooms at Hotel Morgenland combine historic charm and modern design. Wi-Fi is available in all rooms. A rich breakfast buffet is served in the Morgenland each morning. Nearby attractions include Dahlem's Allied Museum and Brücke Museum. The Hotel Morgenland also features a small chapel where guests can relax. A beauty salon and massages are also available on site. Guests can reserve a parking space at the Morgenland's private parking lot throughout their stay. Featuring an 8-lane bowling alley, free parking and free Wi-Fi in the lobby, this family-friendly hotel in Berlin’s Lichtenberg district is just a 30 minute drive ride from Alexanderplatz. The spacious, non-smoking rooms at the Comfort Hotel Lichtenberg include satellite TV and storage space for suitcases. A hairdryer is provided in the private bathrooms. Guests enjoy free use of the saunas and fitness equipment at the Pyramide Fitness World, just a 4 minute walk away. Guests also receive discounts at the Comfort Lichtenberg’s Fun Bowling complex. Hearty breakfast buffets are offered at the Comfort Hotel Lichtenberg. Brandenburg specialties are served in the bowling center's restaurant, while beers and cocktails are available in the lobby bar. The bar has TV with cable channels. The Landsberger Allee/Rhinstraße tram stop is just a 3 minute walk away, providing direct services to Berlin's city center and the Velodrome Arena. Large rooms and regional cuisine are featured at this 4-star hotel in Berlin. Alexanderplatz Square and the lively Hackescher Markt area are 20 minutes away by tram. Holiday Inn Berlin City-East Landsberger Allee has non-smoking rooms with air conditioning and floor-to-ceiling windows. Guests have a choice of pillows, and a bathroom with bathtub and hairdryer. Traditional Berlin food is available in the Berliner Bistro & Bar. The Grenzlos restaurant serves specialties from Berlin's past and present. Cocktails are served in the New Orleans bar and on the terrace. Guests have free use of an internet room with printer. 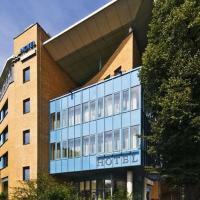 Wi-Fi is provided in all areas of the Holiday Inn Berlin City-East for an extra fee. The Landsberger Allee/Weißenseer Weg tram stop is a 5-minute walk away. This 3-star hotel features spacious rooms, a German restaurant and recreational facilities for children. It is located in the Weißensee district in the east of Berlin. All rooms at the Comfort Hotel Weißensee come with satellite TV, a minibar and Wi-Fi internet. The Comfort Hotel's rich buffet breakfast is free for children up to the age of 7. The Waldoff restaurant serves typical Berlin and German specialties. The children's club includes a selection of books, board games and DVDs. The Weißensee lake is a 15-minute walk from the Hotel Weißensee. Central Berlin is a 30-minute bus and tram ride away. This 4-star hotel features modern rooms, an international restaurant and excellent services with the airport. 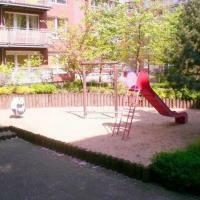 It is in the Tegel district of Berlin, just 3 miles from Tegel Airport. The BEST WESTERN Hotel am Borsigturm's rooms include a modern bathroom, pay-per-view TV and free Wi-Fi. Some rooms have a waterbed. The Hotel am Borsigturm is just over a quarter mile from the Borsigwerke subway station, providing a direct service to the Friedrichstraße shopping street and Checkpoint Charlie. A breakfast buffet is available each morning at the BEST WESTERN. The Borsig-B restaurant serves German and international food. Hotel Transit is in Berlin's Kreuzberg district, a 3-minute walk from the popular Bergmannstrasse street. Located within a converted factory building, Hotel Transit offers bright, peaceful rooms with private bathrooms. Every day, the Hotel Transit prepares a breakfast buffet which is available until 12:00. The hotel also features the Bar Transit which serves drinks and small snacks. The staff at the Transit's 24-hour reception are happy to provide insider tips about Kreuzberg's lively art scene and nightlife venues. The Mehringdamm Underground Station is a 5-minute walk away. This non-smoking 4-star hotel is in Berlin’s Schöneberg district. The Kurfürstendamm shopping street and famous KaDeWe department store are a quarter mile away. Classically furnished rooms with air conditioning, satellite TV and a minibar are available at Alsterhof Hotel Berlin, and the modern private bathrooms include toiletries and a hairdryer. International dishes and a daily breakfast are provided in the Alsters restaurant. Hot drinks and snacks are available in the Scala-Bar. Guests are welcome to use the free internet terminal in the lobby. Free Wi-Fi is available in public areas. The hotel is across from Augsburger Strasse subway station, which provides connections to all parts of Berlin. This 4-star hotel is 200 yards from Berlin's Kurfürstendamm shopping street, a 4-minute walk from Uhlandstraße subway station. It has a 24-hour front desk, free Wi-Fi, and modern rooms with a flat-screen TV. Rooms at the NH Berlin Kurfürstendamm are warmly decorated in brown and beige colors, and feature parquet floors. All rooms include air conditioning, tea/coffee making facilities and a private bathroom. A full buffet is available each morning in the bright and spacious breakfast lounge or on the outdoor terrace in summer. Drinks and snacks are served at the stylish bar. The spa and fitness area at the NH Kurfürstendamm is on the 7th floor. It includes a sauna and solarium, and massages can also be booked. NH Berlin Kurfürstendamm is a 5-minute walk from the stylish bars and restaurants around Savignyplatz Square. From here, there are direct S-Bahn trains to Berlin Main Station and Berlin’s ICC Exhibition Centre. Featuring wonderful views of Berlin from its top floors, this 3-star-superior hotel in central Berlin is less than half a mile from the Kurfürstendamm Shopping Street and the famous KaDeWe Department Store. The popular bus number 100 stops outside the hotel. This bus passes many of Berlin's major attractions, including the Brandenburg Gate, Museum Island and Alexanderplatz Square. A rich breakfast buffet is served every morning in the Sylter Hof's restaurant. During the week, guests can return here for the Business Lunch. 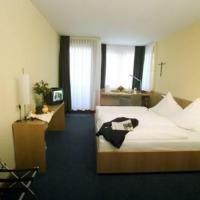 The Hotel Sylter Hof Berlin provides welcoming rooms with satellite TV and 1 free bottle of mineral water upon arrival. Information about Berlin is available upon arrival. The Sylter Hof's modern lobby area is air-conditioned, and includes 2 free internet computers and an inviting bar. Snacks are also served at the bar from 3 pm. This hotel in Berlin’s Wilmersdorf district is just 650 ft from the famous Kurfürstendamm shopping avenue. It offers a tour desk which can organize city tours, restaurant reservations, and tickets for events in Berlin and Brandenburg. The Art-Nouveau-style Olivaer Apart Hotel am Kurfürstendamm offers large rooms with a satellite TV, safe and free Wi-Fi internet access. Private bathrooms include a shower. A buffet breakfast is served each morning in the bright, spacious breakfast room. Several restaurants, bars and cafés are within walking distance. Baggage storage is available at the 24-hour front desk. There is a free shared computer in the lobby. The Adenauerplatz Underground (subway) Station is 1300 ft from the Olivaer apartments, offering services across Berlin.